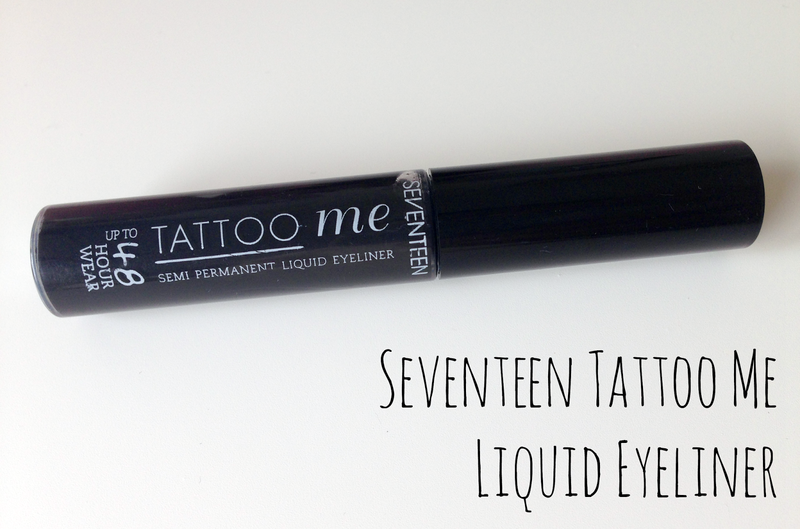 On one of my recent Boot's beauty haul, I mentioned that I managed to bag myself the Seventeen Tattoo Me Semi Permanent Liquid Eyeliner. I say this because every single time I went into Boots to buy this eyeliner - it was out of stock! I finally brought one when I made an order online and as Boot's had a buy one get one half price offer on all Seventeen products, it was pretty obvious what I was going to buy. Originally I saw this product mentioned on a Daily Mail article back in February 2014 about "Make-up you can wear in your sleep" and yes, I've been trying to buy this eyeliner since then! The Seventeen 25 hour foundation was also mentioned in that article and I managed to get my hands on a bottle and I reviewed in back in May last year. Because I had enjoyed the foundation so much, it just made me want to try the eyeliner even more just to see if it too could live up to the expectation. Normally when it comes to eyeliner, I do opt for the felt tip eyeliner as I find them a lot easier and quicker to apply but I did start off using liquid eyeliners so I was hoping that I'd still be able to apply a perfect wing. The top picture is me in the morning when I first applied the eyeliner and the bottom one is around 9 hours after. Ignoring my not so perfect winged eyeliner, the eyeliner lasted amazingly well! To test the eyeliner out better, on this day I had a busy morning shift at work, a good hour in the gym and then came back home to clean the house from top to bottom. Even after all that my eyeliner was still on point and didn't even look to be fading slightly. Although I was impressed by how long it had lasted, that soon disappeared when it came to taking the damn thing off! I clearly was not prepared for this eyeliner and my eyes were very sore from all the rubbing. If you are interested in this eyeliner, definitely invest in some high strength make-up remover! All in all I really enjoyed this eyeliner and it actually does what it says on the tin. I'm not sure on the 48 hours part but it can definitely last through a whole day no problem; not bad for a high street eyeliner for only £4.99! You can check it out here on Boot's website.